A cave believed to have the biggest chamber in Britain has been explored in the Peak District in Derbyshire. Titan's main shaft is 460ft (140m) deep, as high as the London Eye, sculpted out of limestone by rain water over millions of years. 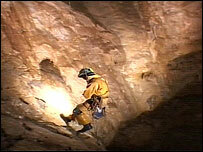 Local potholer and underground explorer Dave Nixon led the team that discovered it in 1999, near Castleton. Dave Nixon examined the old journal written more than 200 years ago by the Cambridge student exploring old mine works nearby. James Plumtree described a network of caves which went further than Leviathan, a well-known cave system near Castleton. The cavers thought the entrance to the system must have been blocked, and spent three years removing boulders before they found a way into the bottom of the cavern. Mr Nixon said: "It wasn't a matter of stumbling, it was a lot of research and a lot of hard work. "We were looking up and all we could see was blackness. We knew we'd found something really big but we didn't know how big at that time." A shaft was later created to allow cavers to abseil into the cavern from above. Titan is nearly 197ft (60m) higher than the previous record holder, Gaping Ghyll in the Yorkshire Dales. Dave Nixon said: "Gaping Ghyll is renowned to be one of the biggest vertical caves in the UK. "Of course there's a certain amount of competition between Yorkshire and Derbyshire, so I was delighted to steal the crown, as it were." Britain's deepest cave is Ogof Ffynnon Ddu, in south Wales, which measures 1,010ft (308m).